The Miller® Trailblazer® 325 EFI with ArcReach®, Excel™ Power & GFCI communicates directly with the remote Miller® ArcReach® wire feeder without the use of a remote control cable. The secret to this technology is built-in circuitry in both the Trailblazer 325 EFI ArcReach welder and ArcReach wire feeder that passes remote control signals through the welding leads, eliminating the need for costly remote control cables. ArcReach remote control distance is limited only by the length of your welding cable leads. ArcReach allows your MIG or Flux-Cored welding operation to take place further away from the welding power source and reduces downtime and costs by giving the operator full remote voltage and amperage control capabilities at the site of the weld without using expensive remote control cables. The Trailblazer 325 EFI ArcReach MUST be paired with a Miller ArcReach feeder to get the full benefits of this feature. The Trailblazer® 325 EFI with ArcReach®, Excel™ Power & GFCI is the most fuel efficient gas engine welder/generator on the market. It is a 325 amp, 100% duty cycle DC welder and 12,000 watt AC generator. The Trailblazer 325 EFI features a Kohler 23 horse power, fuel injected engine with Miller's exclusive Auto-Speed™ technology. Auto-Speed® matches the engine speed with the welding load. 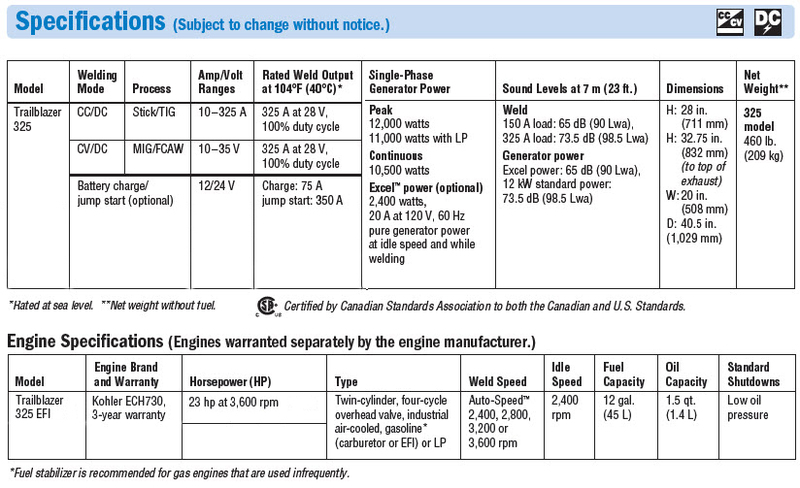 This means that the engine can run at optimum RPM rather than full RPM while under load. This translates into reduced fuel consumption, quieter operation and longer engine life. Excel™ Power provides 2,400 watts of generator power while the engine is at idle speed, resulting in dramatically reduced fuel costs. Excel Power reduces emissions, operating noise and extends run time hours. Two 120 volt duplex plugs with GFCI (Ground Fault Circuit Interruption) come as standard equipment. 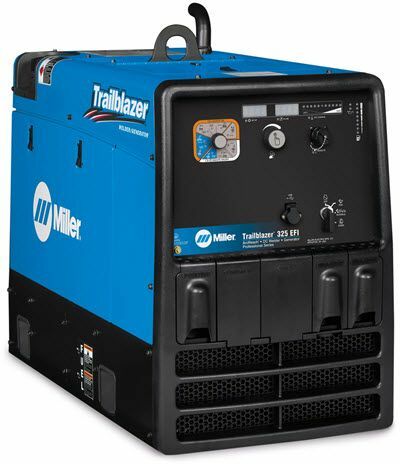 The Trailblazer® 325 EFI has the most smooth, stable welding arc in the business. 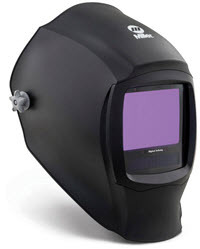 It produces X-Ray quality welds whether you are using MIG, Stick or DC TIG welding processes. Remote control of the power source without a cord - ArcReach™ technology uses the existing weld cable to communicate welding control information between the feeder and power source. This technology eliminates the need for control cords, and their associated problems and costs. Miller® SuitCase® ArcReach® 8 Wire Feeder with BTB 300 gun is a voltage sensing MIG wire feeder that has full remote voltage and amperage control without the use of a remote control cable. Miller® SuitCase® ArcReach® 8 Wire Feeder with Bernard® S-Gun™ is a voltage sensing MIG wire feeder that has full remote voltage and amperage control without the use of a remote control cable. The Miller® SuitCase® ArcReach® 12 Wire Feeder with BTB 300 gun is a voltage sensing MIG wire feeder that has full remote voltage and amperage control without the use of a remote control cable. Miller® SuitCase® ArcReach® 12 Wire Feeder with Bernard® S-Gun™ is a voltage sensing MIG wire feeder that has full remote voltage and amperage control without the use of a remote control cable. Miller® ArcReach™ Stick/TIG remote pairs with your Miller ArcReach™ compatible welder to provide full remote amperage control for your stick or TIG welding application without the use of a remote control cable. Miller Trailblazer 325 EFI With ArcReach 907754002 oil light reset: Turn ignition switch to on, displays will light up: 1 Adjust Control/Select Button Press and hold control for 5 seconds, then release to access the Service Menu. Rotate the knob to scroll through the menu items. Press and release the control to access the options and information within each menu item. Rotate the control counterclockwise to decrease the value or select NO/ OFF. Rotate the control clockwise to increase the value or select YES/ ON. Press and release control to save selection. After 5 seconds of inactivity, the menu will time out and the selection will not be saved. Never used an engine drive before but ill tell you with a 8VS ArcReach suitcase running dual shield this thing welds incredible and is very quite all the while sipping fuel.